This article was originally published on the I am Intramural blog by Ben Chambers, Chief of Multimedia Strategy for the NIH IRP. Nine days after the monstrous 2016 blizzard nicknamed Snowzilla, the sun shone in a bright blue sky on a balmy 50-degree day at the main NIH campus in Bethesda, Maryland—the perfect setting for a four-mile run with two men who’ve logged nearly a thousand miles together. It was Larry Chloupek’s last day at work before retiring, and he wanted to be sure to get one more run in with his longtime trail partner, Darryl Murray. 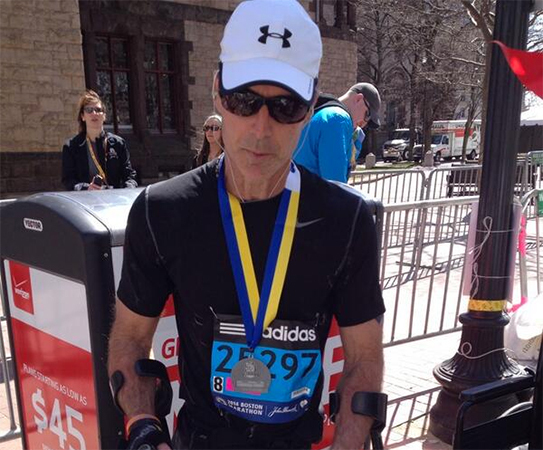 Larry had invited me on their runs before, but I had never stepped up to the challenge. Today was my last chance. Larry is the Management Liaison Director at the NIH, in the Office of Intramural Research (OIR). People describe him as a natural “connector” perfectly suited for his role making sure that administrative processes fit the needs of thousands of IRP scientists and clinicians who conduct biomedical research. After 33 years of government service, 25 at the NIH, he is relocating to Arizona with his wife, Jenn. Larry’s government career began at USDA, then OPM, followed by an NIH position in human resources at the National Cancer Institute, leading to an administrative officer role. In October 2008, he joined the OIR under Dr. Michael Gottesman’s leadership, where he has been the liaison, with his administrative knowledge, to the Scientific Directors, and helped inform the administrative community about how what’s happening in the scientific community is going to affect implementing and overseeing day-to-day operations of the intramural research programs. Part of Larry’s job involved representing OIR on various committees, working with leadership of the Intramural Administrative Management Council (IAMC), putting together monthly meetings for the principal administrative officers within NIH, and developing a number of different classes for the administrative community on such topics as Title 42, risk management, space utilization, and the NIH budget process. “My schedule’s been pretty hectic over the years, but it’s been just a great education for me and great opportunity to meet a cross section of individuals throughout NIH,” Larry says. At the two-mile mark of our jaunt up the Bethesda Trolley Trail, we paused for an all too brief moment to enjoy the sunshine and fresh air. Once a week on average over the past six years, Darryl and Larry have run three to four miles—that’s more than 1,000 miles of conversation, with various coworkers tagging along at times. A couple of years before Larry joined the OIR and moved into Building 2, Darryl had torn his ACL and wasn’t running as regularly as he would have liked. But that quickly changed. “I remember seeing him go out to run and coming by and asking me if I want to come out and join him,” Darryl recalls the days shortly after Larry’s arrival. “So it was a real asset to have him there and have someone come by and say, ‘Ok, let’s go out and run.’ He really helped get me back into consistency, so I’d get back into shape. And I expect to get emails in his retirement, asking whether I got my run in, on a Tuesday or a Thursday especially. Oh yeah, it’ll happen.” Darryl and many others in the OIR and across NIH Institutes and Centers will miss Larry—we already do. We wish you all the best in life, Larry! Have an awesome retirement. Pre-run (left to right): Ben Chambers, Larry Chloupek, and Darryl Murray prepare to enjoy four sunny miles on the Bethesda Trolley Trail.